Award winning furniture logistics company, W.S. Dennison, has been appointed the Irish logistics partner for international retail chain JYSK, ahead of its launch in Ireland. The Danish homeware retailer is set to open 15 stores across Ireland, the first in Naas, County Kildare, this month. Further stores in Drogheda, Navan and Portlaoise are also confirmed to be operational before the end of Summer. W.S. Dennison will provide a combination of warehousing and logistics. Goods will be delivered directly from JYSK’s 700,000 sq.ft Danish distribution centre to one of W.S. Dennison’s strategically-located warehouses in Antrim or Limerick for onward delivery throughout Ireland serving all Irish JYSK customers that choose to order online. W.S. 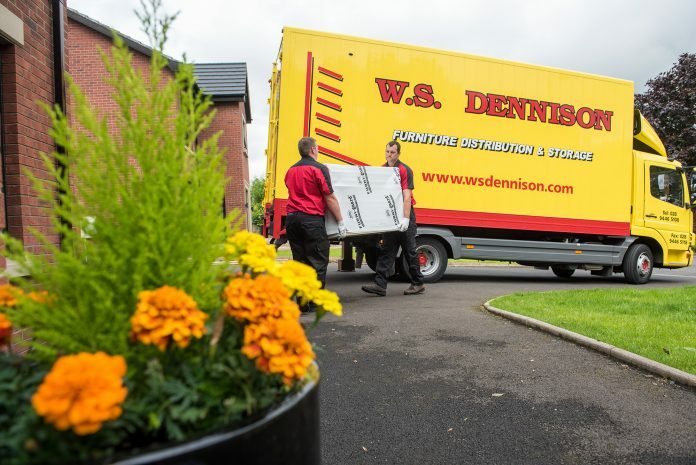 Dennison will be providing its “two-man, white glove” home delivery service to JYSK.ie customers, which includes delivery to room of choice, unpacking and positioning the item in the room. All packaging will be removed and disposed of in line with Irish waste regulations. The company’s dedicated teams will handle all consolidation, home deliveries and reverse logistics on behalf of JYSK, including pre-arranged delivery slots, timed delivery windows and continuous customer communication throughout by its delivery agents. W.S. Dennison’s impressive first-time delivery success rate of 99.25% is an obvious attraction for JYSK. W.S. Dennison, which celebrates 40 years in business this year, has established a reputation for reliability in the Irish marketplace and is also one of the few companies that can accommodate deliveries throughout the island of Ireland. In particular, the company is widely regarded as the ‘Final Mile’ specialist in Ireland by offering full traceability and accountability from manufacturer/retailer to the end-user because it manages everything in-house, with no part of the supply chain sub-contracted. Commenting on awarding the contract, Roni Tuominen, Head of Retail for JYSK in Ireland said: “We’re delighted to be able to offer a full suite of delivery options for Irish customers and our partnership with W.S Dennison for all online orders is an exciting one. As a company they have a lot of experience in this area which gives us great confidence in their ability to deliver an exceptionally high service”. W.S. Dennison’s MD, William Dennison, added, “We’re proud to be selected to support a brand that has become synonymous within the furniture sector on a global scale. We are delighted to welcome JYSK to Ireland and are looking forward to growing and developing this relationship”. Because W.S. Dennison handles only furniture, its entire supply chain is designed solely to facilitate the transportation and storage of delicate and high value items. The new JYSK contract will add to the transport firm’s existing volumes of moving 3,700 pieces of furniture and completing 500 home deliveries throughout Ireland per week.